Ed Hayes went to the local salvage yard in search of some parts he needed for one of his collector cars. Little did he realize when he set out that day that he would stumble upon another collectible car — a 1975 Chevrolet Cosworth Vega — that was destined for the crusher. The car was basically all there; with the exception of a timing chain cover and some other minor parts, this was definitely a restorable survivor and the price was right. That's how this particular Cosworth Vega became a member of the Hayes collector car stable. The Cosworth Vega owes its existence to John DeLorean, who had formerly been the general manager of GM's Pontiac Division. In February, 1969, DeLorean was appointed as general manager of the Chevrolet division in the hopes that he would be a trouble-shooter to restore Chevy's eroding market share. DeLorean was a proponent of the small-car program at Chevrolet and he saw the Vega as a potentially effective weapon on the war against the imports. He also saw the potential for making a high-performance version of the Vega that would appeal to the youth market and generate some favorable publicity for the Chevrolet division. With the latter thought in mind, he charged Jim Musser, the principal designer of the Vega engine, to join forces with Keith Duckworth at Cosworth Engineering, Ltd. UK-based Cosworth was well known for its winning British racing engines, and the plan was to explore the feasibility of modifying the aluminum-block Vega mill for Formula II racing. Ten Vega engines (without heads) were shipped to Cosworth and modification work began. The stroke was shortened from 92.0 to 82.3mm in order to reduce the displacement from 139.5 cubic inches to 121.7 cubic inches to conform with the Formula II two-liter limit. Duckworth had also designed an aluminum cylinder head with dual overhead camshafts and four valves per cylinder. Three prototype racing engines, rated at 270hp each, were completed by September, 1971. DeLorean ordered a feasibility study for a street version that would utilize a detuned Cosworth-modified engine. A marketing and advertising consultant to Chevrolet, Gertrude McWilliams, conducted the study and projected that Chevrolet could sell on the order of 30,000 of these Cosworth Vegas, so plans were formulated to produce the new little street fighter. 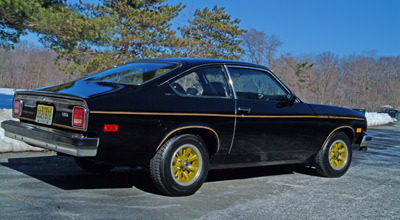 Chevrolet secured the rights to use the Cosworth name on the new special edition Vega, and the wheels were set in motion, so to speak. The gold-toned logo script on the front fenders and the rear panel identify this Vega as a Cosworth limited edition. Only 2,061 Cosworth Vegas were produced in 1975. GM had hoped to introduce the Cosworth Vega by the start of the 1974 model year but, alas, due to the government's newly-revised emissions regulations, this deadline couldn't be met. It wasn't until March 27, 1975 that the production of saleable Cosworth Vegas got underway at the Lordstown, OH, plant. But a lot of things had changed along the way. 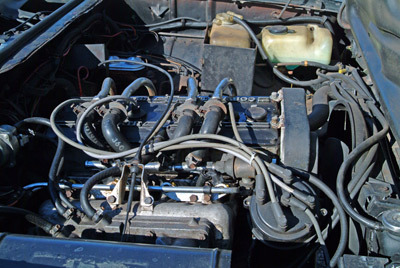 Way back in 1971 when McWilliams conducted her feasibility study, 185hp was the power figure being quoted; by 1973, however, the figure had dropped to 130hp and, owing to Chevrolet's concern for a smooth, quiet-running engine, the horsepower rating was down to 110 by the time the production version finally made its debut. 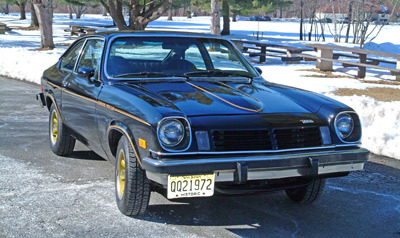 Cosworth, in concert with Chevrolet's engineers, modified the stock Vega engine in several ways. In addition to the new cylinder head they added Bendix electronic fuel injection and high-compression pistons. Low-lift, high performance camshafts and solid lifters complemented shot-peened rods and a forged crankshaft. To help the mill exhale easier oversized exhaust ports and a low-restriction muffler were used. These specially-modified engines were hand-assembled in GM's Tonawanda, NY, engine plant and then shipped to the Lordstown facility after testing. The dual overhead cams and quad valves of the aluminum-block 4-banger endowed the Cosworth Vega with 110hp. The original patina of this 54K-mile survivor is still intact, unrestored. The interior of the Cosworth Vega featured full instrumentation with the exception of an oil pressure gauge; an electric clock resided on the dash panel where the oil gauge should have been. This omission is a puzzlement, especially when you consider the rest of the dash was complemented with an 8,000rpm tach, a temperature gauge and a volt meter. Other modifications to this special edition included torque-arm rear suspension that would later become a standard feature on all 1976 Vegas and heavy-duty front suspension. A breakerless high energy ignition (HEI) delivered spark to the DOHC mill. A "passenger assist grip" (grab bar) and a padded sport steering wheel were also standard issue on the Cosworth Vegas. Interestingly, the Vega "sport" steering wheel found its way into the 1976 Corvette as a production cost-cutting move by GM to re-use parts among other models of the same marque. Understandably, the Vega steering wheel did not receive a joyous welcome from Corvette owners in 1976 and it's a feature that is often joked about in the Corvette world. Although the Vega was available as a coupe, station wagon or sedan delivery, the 1975 Cosworth edition could only be had in the hatchback coupe configuration. And, you could get it in any color you wanted, as long as it was black with gold striping. There were no transmission options for the 1975 Cosworth Vega; the standard gearbox was a 4-speed unit with a 3.11 first gear and 3.73 gearing in the positraction rear end. Creature comforts such as air conditioning, power brakes and power steering were not on the option menu, either. Chevrolet's marketing strategy for the Cosworth edition was off the mark in that dealers were advised to "play hard to get" with their Cosworths — the plan was to keep them on the showroom floor a while to whet the public's appetite for the cars rather than to sell them off immediately. For several dealers this plan backfired — they were stuck with unsold Cosworth Vegas they could have easily unloaded when they first came in that now had to be sold at drastically reduced prices just to get rid of them. Gold-painted aluminum wheels were also an identifying trademark of the Cosworth Vegas. The rear wheels were coupled to a 3.73 positraction differential which was also unique to the Cosworth editions. In 1976 the Cosworth Vega remained basically unchanged from the 1975 edition except that a 5-speed manual trans was offered as an option coupled with a 4.10 rear axle ratio to improve acceleration. Other options for the 1976 model year included a sliding sunroof, an 8-track tape player and some other goodies (see the production statistics). Additionally, the Cosworth Vega now could be had in any of the other stock Vega colors including Buckskin, Dark Blue Metallic, Firethorn Metallic, Dark Green Metallic, Medium Orange, Mahogany Metallic, Medium Saddle Metallic and Antique White. Total 1976 Cosworth Vega production dwindled down to 1,446, with the final car rolling off the assembly line on July 23, 1976. Just sixteen months from the time the first one came off the line, the end of the Cosworth Vega was at hand. The Cosworth Vega came about at the insistence of the then General Manager of Chevrolet, John DeLorean. DeLorean wanted a Vega "image model" that was "a highly sophisticated sports concept designed to generate excitement and bolster interest in the GM domestic small car market" and "to establish the design superiority and engineering excellence of this Vega option in the minds of knowledgeable enthusiasts". The styling cues of the second-generation Camaro are undeniable on the Cosworth Vega, especially when viewed from the front. The hood, headlight buckets and entire nose of the car smacks of Camaro overtones. Though an attractive little car, it didn't fare well in the marketplace. The fact that it cost almost as much as a new Corvette at the time didn't help matters either. 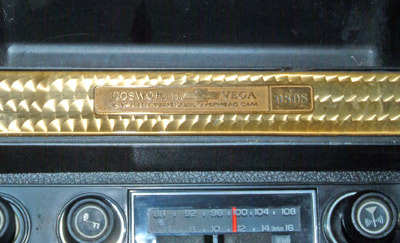 All Cosworth Vegas featured a gold-toned engine-turned dash with full instrumentation. The horn button of the steering wheel also identifies it as a Cosworth edition. 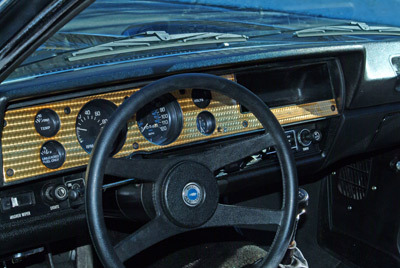 The Vega steering wheel was also used on the 1976 Corvette — a distinction owners of '76 'Vettes tend to play down, understandably. The three major reasons for the car's lack of success and ultimate demise were poor quality control, performance that wasn't anywhere near up to expectations and, probably the biggest factor, the price tag. 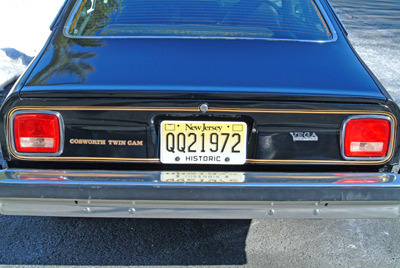 The 1975 model had a sticker of $5,979, while the 1976 model went for $6,066 (plus options) — this was more than double the price of a "regular" Vega. At these prices the Cosworth Vega was only a few hundred dollars away from the price of a new Corvette. Potential buyers entering a Chevrolet showroom had a real no-brainer with this one: Vega or 'Vette? Duh, let me think about this for about 2 seconds. Engraved dash plaques bearing the production serial number of each car were standard equipment on the Cosworth editions. When the current owner of this car brought it to a regional Cosworth Vega show it raised several surprised eyebrows, since it was rumored that #0808 had been destroyed. In truth, that rumor would have become fact if Hayes hadn't visited the boneyard when he did. In cleaning the car's interior for this photoshoot, Hayes uncovered the original factory Water Test Inspection document, dated 3 - 28 - 75, stuck to the bottom springs of the driver seat, where it had been stowed some 33 years ago. And, despite its lack of success in the marketplace for the two years it was offered, the Cosworth Vega has become a very collectible car 3 decades down the road. There's even a Cosworth Vega Owners' Association, Inc. (CVOA) that "was founded in 1980 and is organized as a non - profit corporation. It is internally organized into sixteen regions with members from all fifty states plus Canada and Europe. 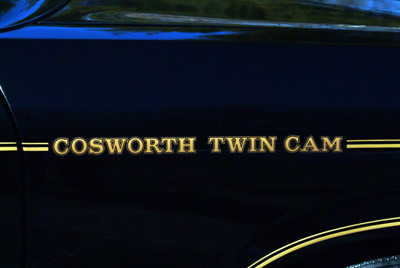 The CVOA is dedicated to the maintenance and preservation of Cosworth Vega automobiles. 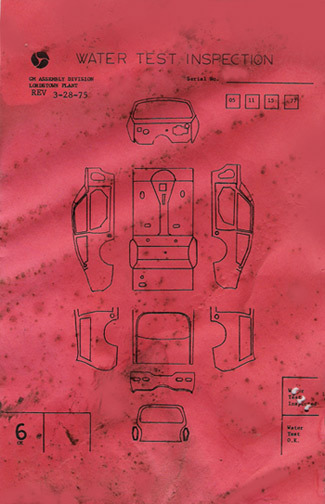 The CVOA is the world's only remaining organization that continues to research the history and technology of these rare and unique automobiles while providing logistics and technical support." For more information visit the CVOA website. So the little "import killer" has its own fan club and is finally getting the recognition it didn't get 30 years ago. It would seem that what goes around comes around — eventually.